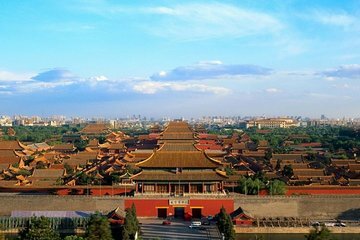 Die Verbotene Stadt, der Himmelstempel und der Sommerpalast sind drei von Beijings beeindruckendsten UNESCO-Welterbestätten und diese ganztägige Tour besucht alle drei. Mit einer maximalen Gruppengröße von nur fünf Personen genießen Sie zusätzliche Aufmerksamkeit von Ihrem Reiseleiter und Abholung vom Hotel, Mittagessen und Eintrittsgelder sind inklusive. The English speaking guide, Helen, was excellent, and I rate her top marks, but there was not enough time to cover all three locations and lunch PLUS a couple of 'infomercial' stops that we were not expecting and had no real interest in doing. We ended up with only an hour for the Summer Palace, a huge site. One thing that also delayed us was that I am somewhat impaired for long walking, and gave the tour organizer a note to that effect when signing up online, that I have to limit my walking. Perhaps they should have let me know that this was not a good tour for me, that being the case. If my son had not been with me, I would not have managed it at all. Very fun day. Aside from half of the Forbidden City being closed off for foreign dignitaries the day we were there, the rest of the tour was perfect. The group I was part of was fun to be around, too.